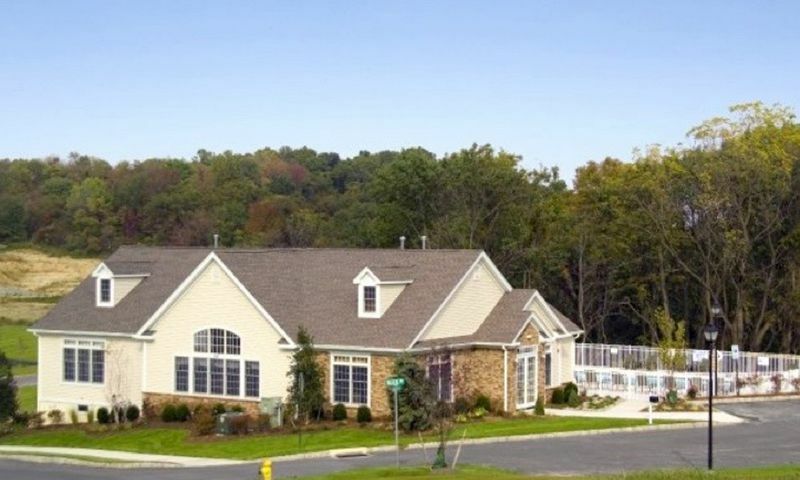 Legacy at Morgan Hill is a 55+ community in Easton, Pennsylvania. This gated, townhome community sits on top of a hill, giving breathtaking views of the towns below and the Delaware River. Country Classics began construction in 2006 and development at Legacy at Morgan Hill continues today and will offer 127 townhomes in five distinct styles. Although Legacy at Morgan Hill is modestly sized and quiet, it is just a short drive from New York City and Philadelphia and offers some of the best golfing in the region. A 4,000 square-foot clubhouse resides in the middle of the community and serves as its core. Residents can find a new hobby in the crafts room, practice their shot in the billiards room, or explore an unknown subject in the clubhouse's library. Explore your creative culinary side with your friends in the kitchen of the spacious community room. Stay in shape by getting into a cardiovascular routine at the fitness center or do some laps in the heated, outdoor pool when the weather wants to play nice. Adjacent to the community grounds is the award-winning, casually elegant Vintage Restaurant and Bar, which hosts live entertainment every week and stunning views of The Club at Morgan Hill, an 18-hole course featuring 6,749 yards of golf, where you can play a quick round with friends before dinner. Legacy at Morgan Hill will offer 127 different townhomes available in five different plans as new or resale options. Your simple, rural environment can be complemented by a basic 2,425 square-foot Lauder floor plan or the more luxurious 2,850 square-foot Pines plan. Whichever you choose, you can customize your home with a deck expansion and a sun room. All of Legacy at Morgan Hill's models come with a two-story foyer, a gas fireplace in the family room, a Jacuzzi Tara in the master bathroom, and a study with a walk-in closet on the second floor. All of the homes in Legacy at Morgan Hill include two bedrooms plus a den, two-and-a-half bathrooms, and a two-car garage. Some homes have the option of combining the two walk-in closets for a more spacious wardrobe. Legacy at Morgan Hill regularly hosts community events. Enjoy the big game with a Super Bowl party, get moving with a doo woop dance, challenge your friends to a billiards tournament, or explore other cultures with their International Night. During the summer months, many residents converge on the clubhouse for holiday barbeques or pool parties. Residents also have the historic town of Easton to explore. With restaurants, antique shopping, and dozens of golf courses at arm's length, Legacy at Morgan Hill residents do not lack in entertainment. Easton was also one of the first towns where the Declaration of Independence was read, which is celebrated every July with a reenactment and a festival showcasing the local culture and arts scene. Legacy at Morgan Hill is located just south of I-78 and is a short walk from the confluence of the Lehigh Valley and Delaware Rivers. Lehigh Valley International Airport is just twenty-five minutes away, ensuring that your next adventure is close-at-hand. Easton is located about seventy miles west of New York City, with its legendary, world-class entertainment, shopping, and restaurants. Philadelphia sits about seventy miles to the south, luring visitors from around the world curious about the country's history. Closer to home is Allentown, known for its vineyards and the location of a Sands Casino, as well as the Crayola Experience for when the grandkids come to visit. With the vast amount of amenities and exciting surroundings, Legacy at Morgan Hill will help anyone achieve the active adult lifestyle. Clubhouse - 4,000 Sq. Ft. There are plenty of activities available in Legacy at Morgan Hill. Here is a sample of some of the clubs, activities and classes offered here. The townhomes are offered in five different plans, ranging from 2,425 to 2,850 square feet. Each offers two bedrooms plus a den, two-and-a-half bathrooms, and a two-car garage and includes natural gas heat, a study and loft on the second floor, and a master bedroom/bathroom on the first floor. I bought my townhome here a couple years ago and am very happy with it. The area is nice and has a lot of great golf courses. For those who spend as much time on the links as I do it's a plus! Townhome living is great for golfers - no time consuming yard work or upkeep to distract me from the game and just enjoying life! 55places.com is not affiliated with the developer(s) or homeowners association of Legacy at Morgan Hill. The information you submit is distributed to a 55places.com Partner Agent, who is a licensed real estate agent. The information regarding Legacy at Morgan Hill has not been verified or approved by the developer or homeowners association. Please verify all information prior to purchasing. 55places.com is not responsible for any errors regarding the information displayed on this website.